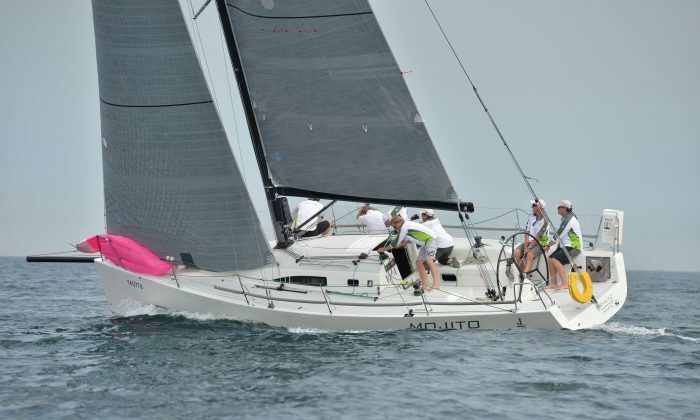 Mojito clinched another two wins in the final race day of the Hebe Haven Spring Saturday Series to win the IRC title with a perfect total of eight points. Meanwhile, in the HKPN division, Bits and Pieces held on to win the series with 18 points. With bad weather forecast, competitors were ready for the worst, but it turned out that it was a pleasant afternoon with some sunshine. There was only a light breeze, but it was good sailing for Race-11 and for most of Race-12. The faster boats completed both races in good time, but the slower boats had trouble at the end of Race-12 as the wind dropped to almost zero. Mojito took line honours and won on corrected time ahead of Vixen in Races 11 and 12. Lighthorse checked in with a third and fifth, Krampus finished fourth and third, and Stella finished fourth in Race-12. With the results of only eight races to count out of the 12-race series, Mojito recorded eight wins. The J111 also came in second and third, respectively, in two other races. She retired during Race-7 due to an injury to one of the crew and did not take part in Race-8. But apart from that misfortune, Mojito has had a superb series. Vixen came second on 14 points with a steady performance, finishing in the top three in all 10 races she entered. Stella’s results were more variable, but she finished in overall third spot on 23 points. Bits & Pieces had two good races on the final day, finishing with line honours in both races, but was placed fourth and second, respectively, in the two races on corrected time. But these performances were enough to keep her in the overall winning position. Before the races, Toby Jenkin-Jones, owner/skipper of Bits & Pieces was bemoaning his fate at being given increasingly difficult handicaps as the series progressed. “Over a similar length of course to that of our last race we would now have to cover the course four minutes faster to win,” he complained. X-Terminator had a good afternoon finishing first on corrected time in both races to push her ahead of Kyte and Dea II in the overall standings. Kyte came in second and third in the last two races, respectively, to keep her in overall third spot. But Dea II dropped down to fourth place overall after recording two seventh places on the final day. Five Magic 25’s took part in the racing with Merlin winning with 2 points, taking first place in each race, Catch 22 and Phoenix finished on 6 points, Black Magic on 7 and Good Vibrations on 9. The Summer Saturday Series starts on May 25 and the Typhoon Series commences on June 2. Both events are organised by the Hebe Haven Yacht Club. The Royal Hong Kong Yacht Club celebrate the end of another successful season with their Spring Regatta, which takes place this coming weekend on Saturday May 18 and Sunday May 19. Over 100 keel boats are expected to take part across 10 Classes.